Short private eye Sean NMI Sean grabs his gat and gets on his high horse to battle a roving gang of thieves and murderers. The gang has come to town after an unsolved pharmacy murder and robbery. A mysterious silver-colored case of unknown contents appears and disappears as Sean sorts a tangled web. When the gang targets Sean's lady love, he mounts his high horse and like a house afire rides to retribution. I love a good mystery, and this is definitely a good one. This book is a private eye detective mystery, not something I usually read. When PI Sean Sean is called by a friend and asked to meet him at a specific address he shows up to find a house on fire. It isn’t long after Sean starts to investigate that he learns that there is more to his client’s story. He is given several warnings from people who want him to leave things alone. When his girlfriend’s third cousin’s name comes up he feels he has to follow the case all the way through. This is a very descriptive and full of action book. It is one you will need plenty of time to read because you will not be able to stop once you start. I know because I couldn’t. 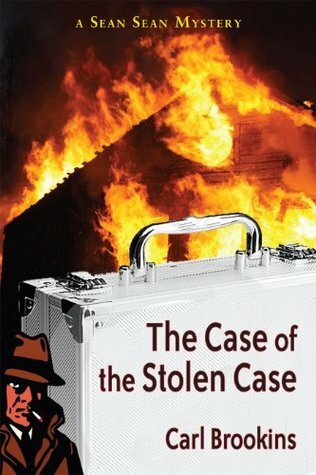 If you are someone who really loves detective stories then pick up one of Carl Brookin’s many books. Carl and I share a writers' group, and his writing is always an amusing nod to the old-fashioned noir, cleverly written and a good puzzle.